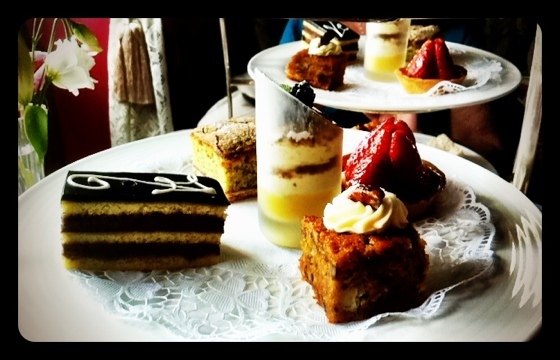 For Mother’s Day this year, my brother bought a gift voucher for afternoon tea for two in Adare Manor, Limerick, for my mother and me. We debated making a reservation for Mother’s Day itself but decided that it would be too busy that day, so we waited a few weeks instead. Was it worth the wait? Absolutely! When we arrived we were the only people having afternoon tea, and we had a table with plush high backed chairs, seated by the window overlooking the gardens. I ordered the Vegetarian Afternoon Tea, and my mother ordered the Traditional Afternoon Tea. 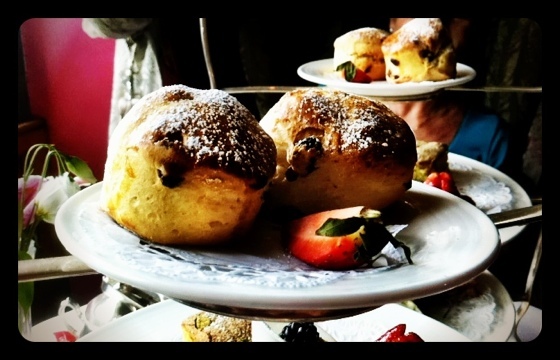 The scones and desserts were common to both – only the sandwich layer differed. 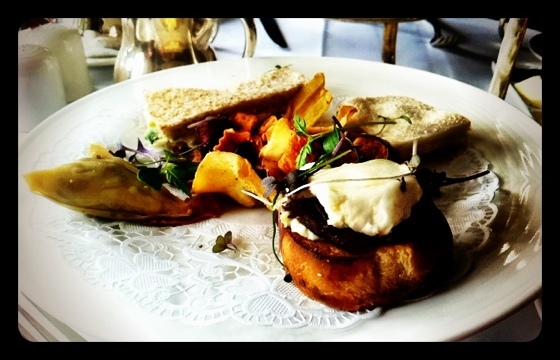 I had vegetable samosa, goats cheese with red onion jam, cucumber and cream cheese, and an egg mayonnaise sandwich – with the crusts cut off of course! My mother’s sandwiches included a chicken wrap, a croissant with ham and cheese, a salad sandwich and a smoked salmon sandwich. The food was accompanied by a pot of tea, and the whole meal was finished off with a glass of Prosecco. All in all, a lovely relaxing afternoon out. Glad you enjoyed it, I should have told you that they will pack up the leftovers for you if you ask. They offered alright Julie, but we were so stuffed we said no!